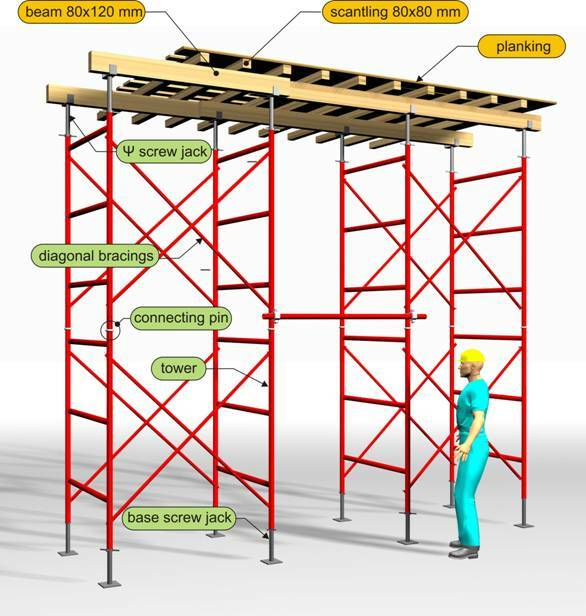 • plank or balk with 50 mm thickness, width varying from 200 to 300 mm and length 4.0 m.
The elements of a conventional scaffold are made out of hollow steel sections with a usual di-ameter around Ø50. These sections are used for the formation of the standards and the frames. 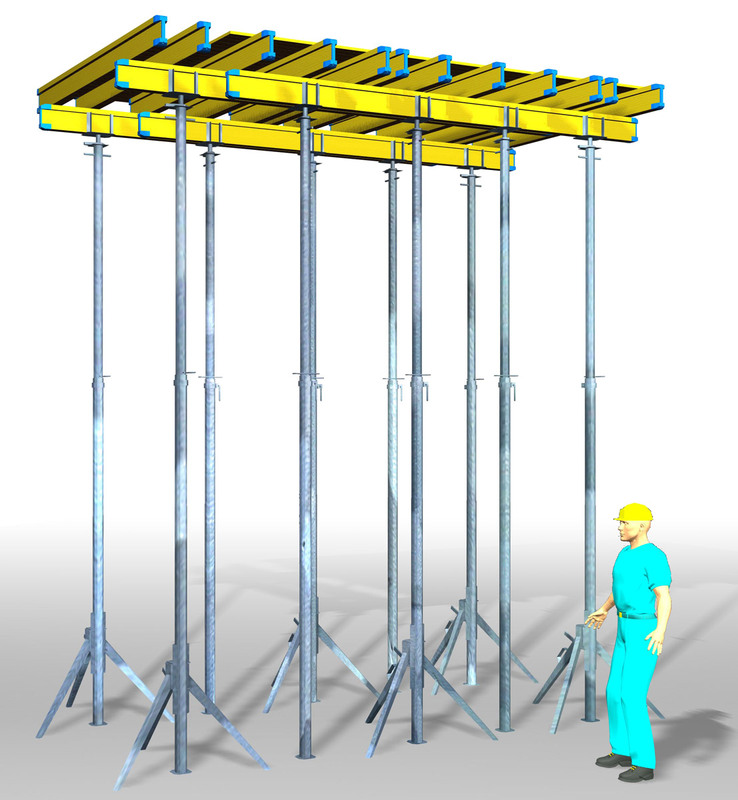 Frames usually have a height ranging between 1.20 and 2.50 m but when combined with the base screw jack and the upper “Ψ-shaped” screw jack, they may reach almost any height. 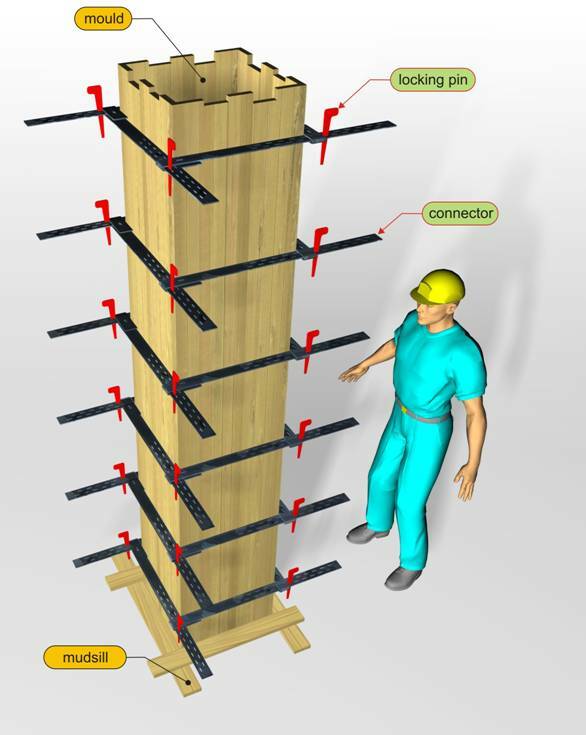 Generally frames are vertically tied together with the use of diagonal bracings made out of hol-low steel sections varying between Ø25 and Ø30 thus forming the towers. The accessories of column moulds secure the position of the lateral elements against the “hy-drostatic” pressures applied during casting. The most intense problem appears in columns and shear walls because of their large height and consequently because of the high lateral pres-sures that appear. The connectors are usually made out of steel, they have an adjustable length and they are placed every 200 to 500 mm. Industrial formworks are a combination of timber, steel, aluminum and plastic and their names vary according to their production industry. By comparing the advantages and disadvantages and their corresponding importance, we fi-nally conclude in the indisputable superiority of the industrial formworks against the conven-tional formworks. 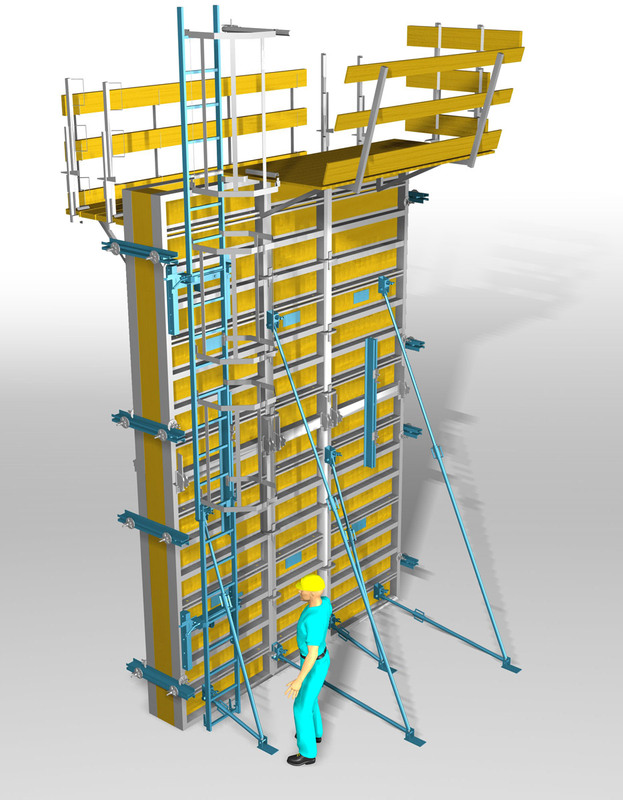 Taking into consideration that the use of self-compacting concrete (see § 2.4.9) will probably predominate in the construction of earthquake resistant structures, the in-dustrial formworks are the ideal solution since it can adequately bear the large pressures ap-plied to the inside of the mould. The following figures show three cases where industrial formworks are being used. In all three cases the common characteristic is the large height of the structural element. The construction of the beams’ and slabs’ formwork is performed with the use of composite, tim-ber T-section beams and shuttering plywood without nailing. Scaffolds are made out of alumi-num. Formwork dismantling is performed by releasing the special pins at the top of the scaffold, that way it controllably recedes around 50 mm without damages and without danger of accident. Assembling the formwork of a 5.50 m high shear wall and positioning the working platform re-quires only a few minutes. 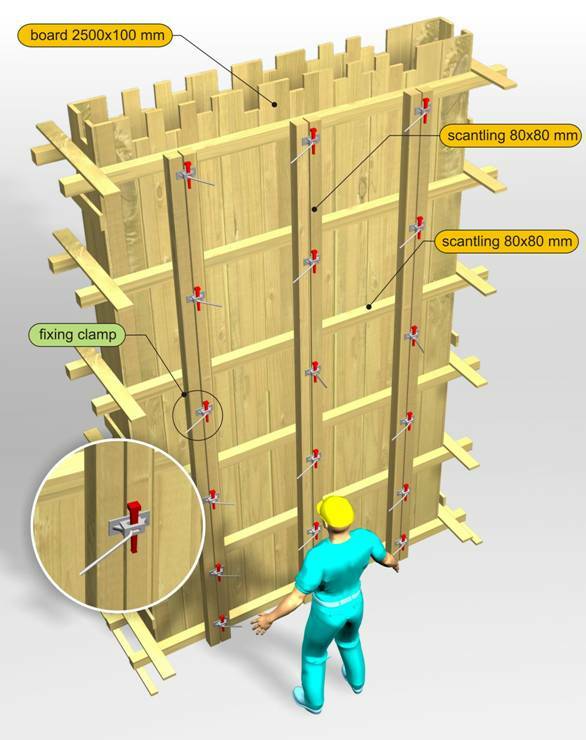 Removing that formwork requires even less time and it is a fast and safe procedure. 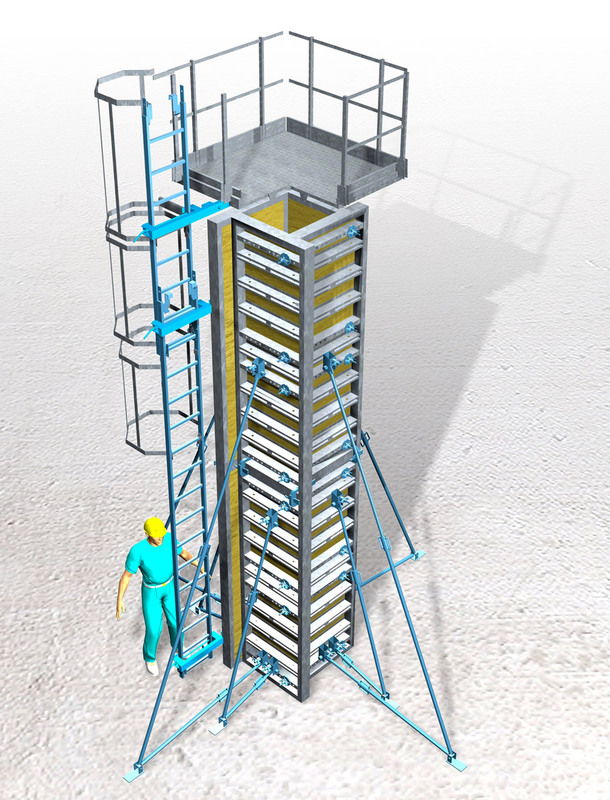 This column is 5.50 m high and its formwork is quickly created by assembling formwork pieces with dimensions divided by 50 mm. These pieces are tied together with butterfly valves, placed in predefined positions. The formwork is temporarily supported by light-weight diagonal struts. The working platform at the top as well as the ladder are being placed and removed within a few minutes. In case that the surfaces of the shear walls, the beams and the slabs are going to be plastered, it is mandatory to wash them well by means of pressure pumps in the order of 100 atmospheres followed by all the necessary practices in order to increase the adhesion between the substrate and the plaster. In cases of particularly careful industrial formwork implementations, it is remarkable how the fi-nal plastering might be avoided due to the excellent and ready for coloration surface. The use of moulds made out of water-resistant cardboard, metal sheet or plastic, leads to the fineness and more economical construction of circular columns.